It has been a really long time since I focused on a Top 5 list. I used to do them somewhat often. I thought it might be fun to bring them back here and there, so I'm starting with today's post on what scents I'm going to be using the heck out of during this spring. And yes, they are all floral based. Cue the Miranda gif (see it below in all of its beautiful glory)! Ha! 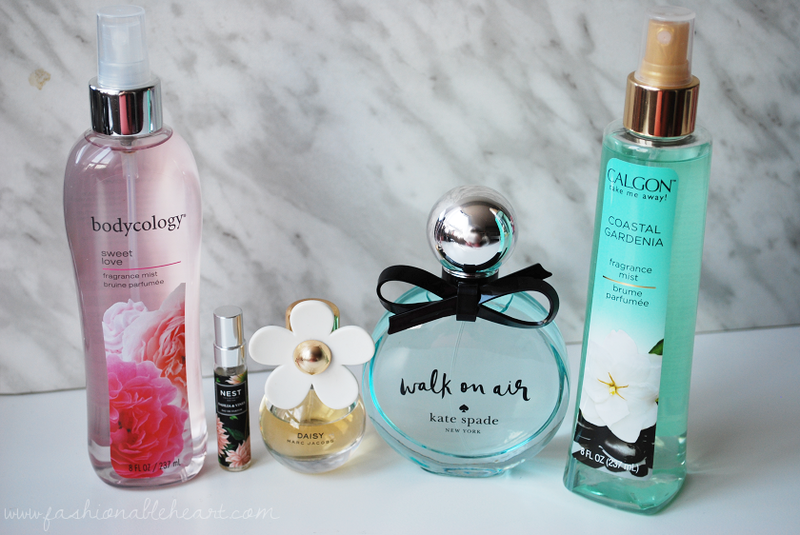 I am really attracted to light scents during the warmer months and that usually means floral scents for me. I am really picky about my florals, though. So here's what made the cut to stay out on my vanity in the coming months! Bodycology Sweet Love* - I thought this would smell like Victoria's Secret Love Spell (another good one! ), but it doesn't. It's close, but this one is a bit more floral. I think the actual closest would be Bath & Body Works Sweet Pea (also another good one!). And let me just say, I think this one lasts longer on my skin than either of those two. The floral note is sweet roses. As someone who hates more rose scents than she loves, this gets an A+. Nest Fragrances Dahlia & Vines - It's funny because this is one of those scents that I don't care for much in the bottle, but really like once it is on the skin. I don't have another fragrance like it and it's the heaviest scent of my choices. Perfect for date nights! It gets its floral punch from rose, peony, and daffodils. It lasts a long time on the skin and very little is needed. Marc Jacobs Daisy - My oldest favorite of the bunch! It's hard to believe that Daisy has been around for over ten years. The closest perfume I have to it in my collection is Chanel Chance Eau Tendre. The main notes are violet leaves, strawberry, and jasmine. I find jasmine to be overpowering in most cases, so that's what sticks out the most for me. It's definitely a light scent. Kate Spade Walk On Air - I got this one for Christmas and it was love at first sniff. And besides the scent, I just love the packaging. The little bow is perfection. I love how thick the glass is and how the lid is weighted. I feel like this is a weightier Daisy, still a light scent but less emphasis on the jasmine and more spotlight on others. For instance, Lily of the Valley, White Iris, Calebrese Bergamot, magnolia, and Linden Blossom are all present. And being from the south, I can never say no to a scent with magnolias. Calgon Coastal Gardenia* - The smell of this one is right in the name. It has notes of gardenia, but it's also aquatic in scent and takes me right to the beach. Gardenias blossom in warmer months, so spring and summer are the perfect time to put this into my scent rotation. It has the sweet scent of gardenia, jasmine, and tuberose, but an underlying rain scent. It's unique to anything I have in my collection. And while we're on the topic of Calgon scents, do yourself a favor and try Hawaiian Ginger. It's been a favorite since my high school days! I need to repurchase it, because I haven't had a bottle of it in forever. 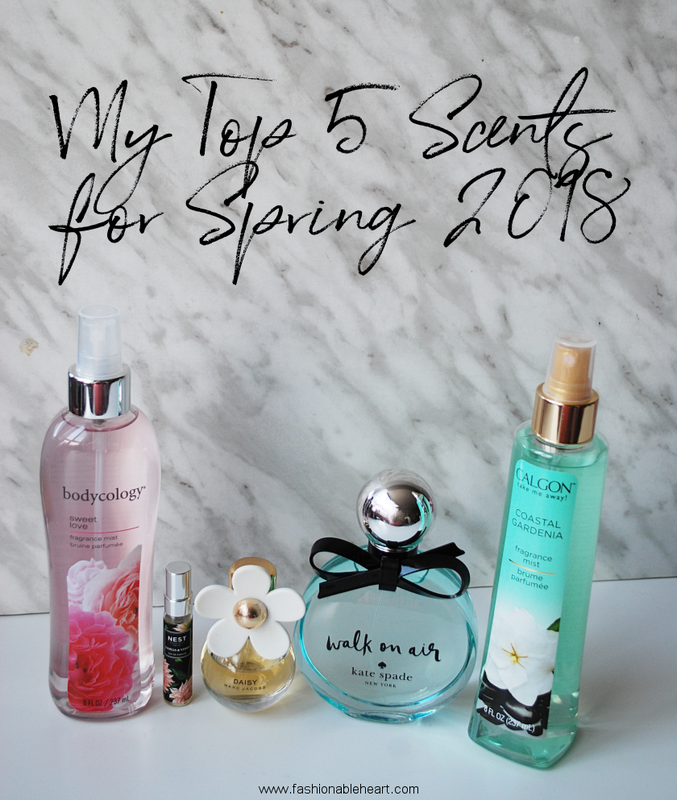 So there we have it, my top 5 scents that I will be reaching for during spring. What fragrance has won you over recently? I'd love to know! **Items marked with an * were provided for testing and reviewing purposes and both are available to purchase at Walmart Canada or wherever Bodycology and Calgon products are sold. All opinions and pictures are my own. There are no affiliate links in this post.